Friday, September 21, 2012, at the Association of Water Technologies (AWT) Annual Conference in Palm Springs, California, French Creek Software received one of the highest honors given by the organization: AWT Supplier of the Year. 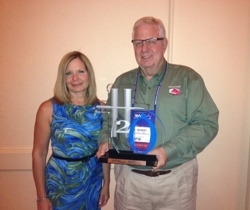 In a ceremony before hundreds of AWT members and fellow suppliers, French Creek Vice President, Janet Ferguson and President, Robert J. Ferguson accepted the award on behalf of French Creek. In 1989, French Creek Software debuted her initial product, WaterCycle® - Cooling Water Modeling Software, at the AWT Annual Convention and Exhibition. Thanks to that initial launch at AWT, French Creek and WaterCycle began gaining traction towards becoming the internationally used tool it is today. Since then, French Creek has attended the conference each year, exhibiting and presenting various papers. During his acceptance speech, Mr. Ferguson gave a heartfelt thank you to the AWT and the many members who have adopted French Creek into their treatment toolbox. - Rob Ferguson, Accepting the 2012 Supplier of the Year Award. Visit the WaterCycle product page for technical specifications and more software examples. Payment is accepted via bank transfer and most major credit cards in the Online Store. The chemistry behind French Creek programs is complex. Understand it with the free Online Library.